Solvang, California—February 15, 2018 – Solvang Antiques and Judith Hale Gallery welcome Spring with the opening of their annual Spring Art Show ‘New Beginnings for Spring.’ Join them for a champagne reception on Saturday, March 17th from noon to 4:00 pm. Mingle with the artists and enjoy painting demonstrations by Dirk Foslien, Sheryl Knight and Mary Kay West. The freshness of Spring and sweet fragrant air create an atmosphere of expectation and new beginnings. The artists in the show capture these elements in their unique artworks presenting a collection of new creations in oil, pastel and sculpture. 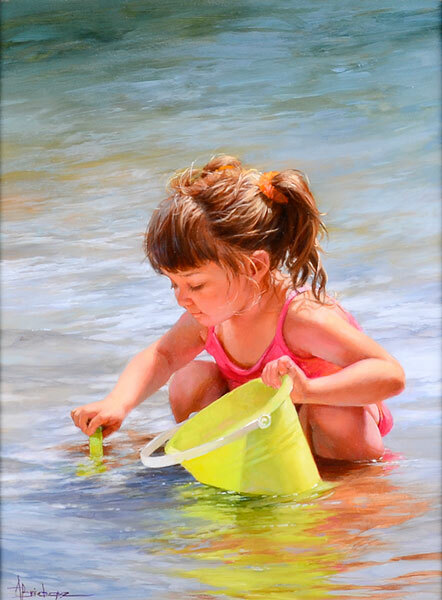 Oil painter Anne Bridge of Wisconsin has added sweet charm to the Spring collection with her paintings of children at the beach. What is more fun than “Buckets of Fun,” as she has titled one of the pieces for the show? Other new works celebrating Spring will be exhibited by Sheryl Knight, Marilyn Simandle, Ted Goerschner, Jannene Behl and Mary Kay West. “We hope that ‘New Beginnings for Spring’ will inspire you to join us for this opening. See you there!” says Hale.